Why? Well because I’m rubbish, AND all it’s done here since Christmas is rain…and rain…and rain some more. The road in front of the boys school has been flooded, prompting a welly wade each morning to get in and some interesting driving to get there. We are, however, extremely lucky that our house has stayed warm and dry and (mostly) with electricity, which is more than can be said for many poor folk around here, not to mention all those on the south-west of the UK. 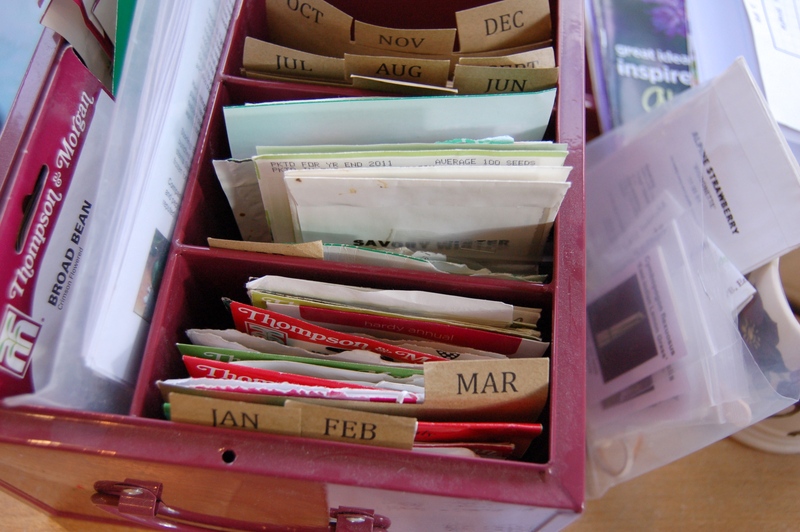 Still, even if I can’t go out and work in the garden (the ground is simply too wet), I can plan, so for the first time this year the seed box has come out so I can see what I hope to grow this year, ideally using up all old seed before buying any new. There are also potatoes and I’m sure I’ve forgotten many other things. April has rather taken over my box, it has been given a section all of its own. As succession seeds are used the packets will get moved to their ‘next’ timing slot (in a feeble attempt to keep up with the sowing). 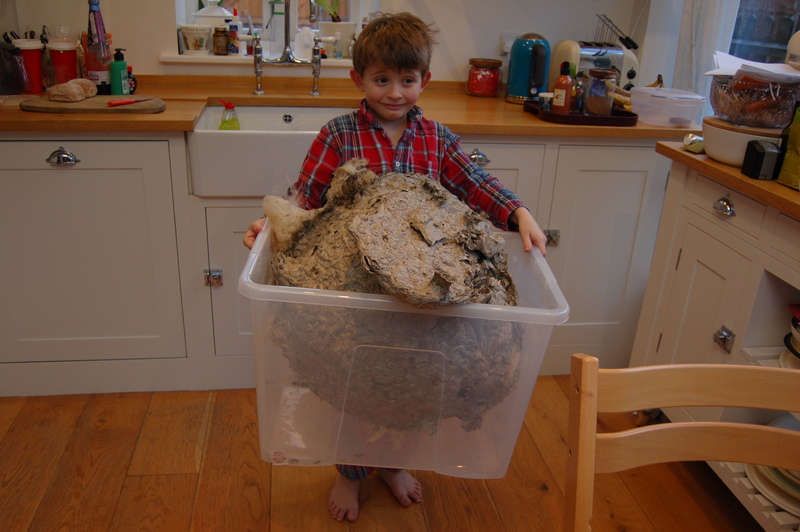 On a totally random note, look when I found in our small loft space yesterday, that, my friends, is the biggest wasps nest ever! See how happy C is to be holding it. 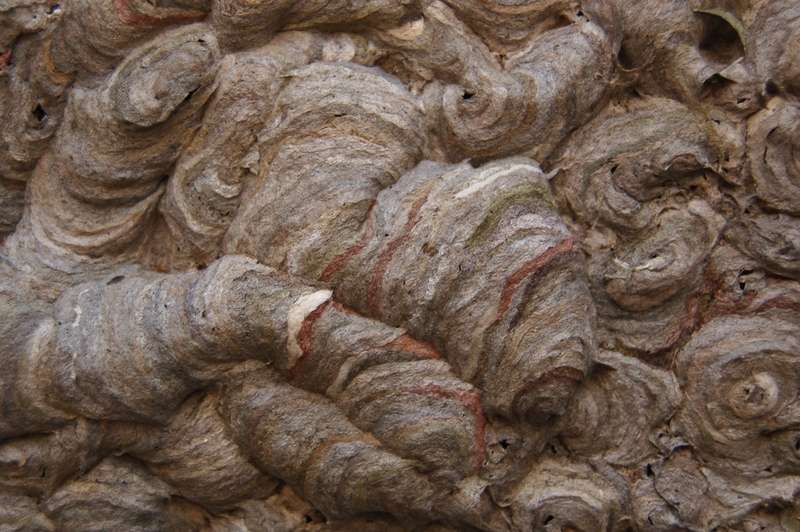 It’s very pretty close up, you can see all the layers of different wood the wasps have used to create the delicate structure, I hope to get some better photos before donating it to school. 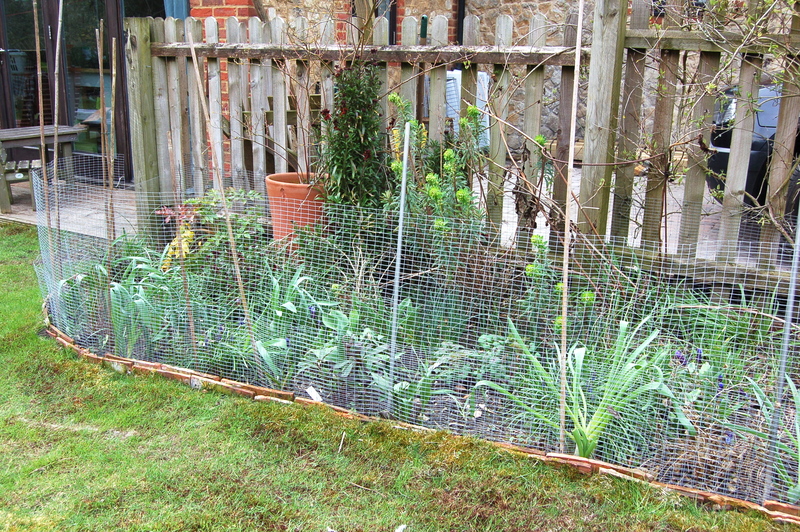 still rabbit proofed and it’ll have to stay that way for a while longer as those pesky furry critters are killing my top border eating anything in site, so I can only see the pretties when I go and look over the side of the fence. I’m thinking about attempting to rabbit proof the whole garden again, maybe, or turning all Mr McGregor and taking a liking to rabbit pie. 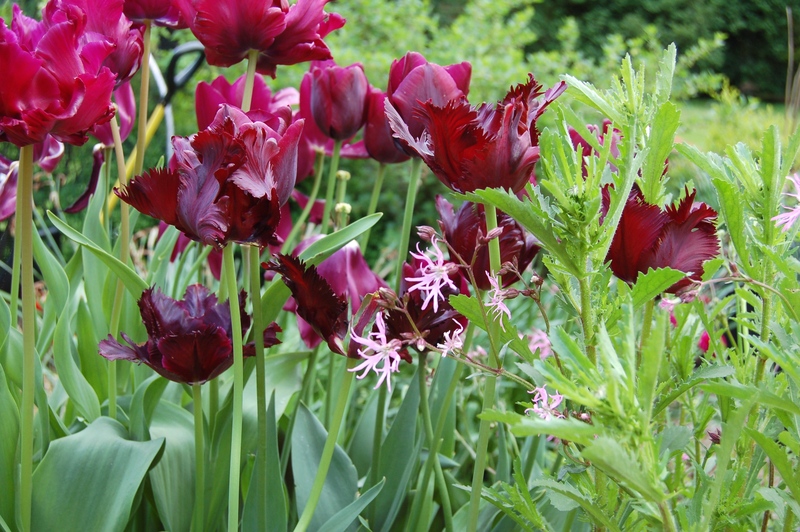 I’ve mostly been tidying and weeding in the garden and enjoying seeing what has survived the winter. 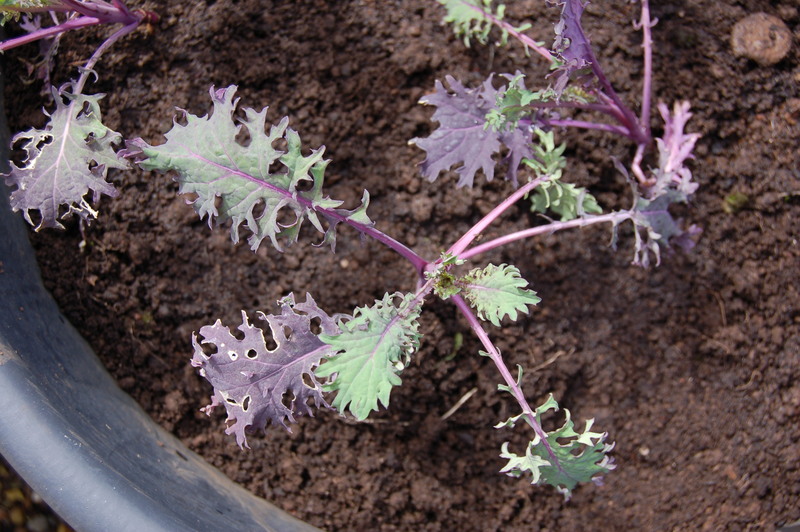 Last year I threw some unknown seeds into the large pots to see what happened, they turned out to be Kale ‘Red Russian’ which I’ve thinned out. They look a bit scrappy at the moment but I’m impressed that they have germinated at all, considering our dreadful weather. There are also some Purple Sprouting Broccoli plants in various stages, this would be because I planted different varieties to span the season, but sadly I can’t remember which is which! I’ve cut out the main tip, to force the side shoots to grow and I’m most excited about eating them with some nice anchovy and caper butter. The everlasting Spinach ‘Perpetual’ is growing well as are Chard ‘Bright Lights’, Alpine Strawberries and there is hope for my Wild Garlic this year plus the Garlic and Shallots planted earlier are growing well. 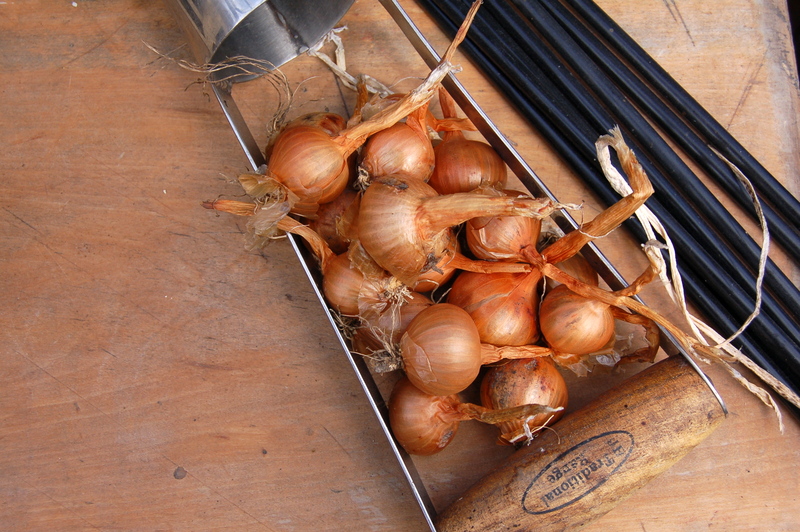 I wanted to post this photo of some shallots, abandoned in the greenhouse last autumn. They are still in great condition, firm and very edible just left unprotected and in full daylight, which considering the ones brought indoors are long gone, mainly from being eaten but some went a bit nasty and had to be thrown out. It makes me think I might just store them in the greenhouse in future. I nearly wrote 2012 in the title, I keep forgetting we are in a new year. So, it’s that time again, when I pull out the slightly dusty seed boxes and have a look at what’s in there. In the olden days, the boxes wouldn’t be dusty, as I’d have spent the colder months obsessing about what I’m going to grow, but my early enthusiasm for the garden has waned over the years, partly as my sewing has taken over and also as I try to get grip on the house. Spurred by recent sewing (spring flower brooches) I feel inspired, and this year, I really want a pretty garden again, and I know it’s not that hard. There are a few rules I need to set myself though, use up all my existing seed and remember that we will be away at crucial points so I HAVE to consider how the seedlings and plants will survive if not watered daily. Also, the usual rule of only plant what we will eat applies, I hate to see precious hours of work end up in the compost heap because I lost the energy to deal with the excess. Ok, I think that’s enough for now. I also have a ton of salad leaves, more herbs that I’d know what to do with plus some successional peas, but I think they warrant a post of their own. 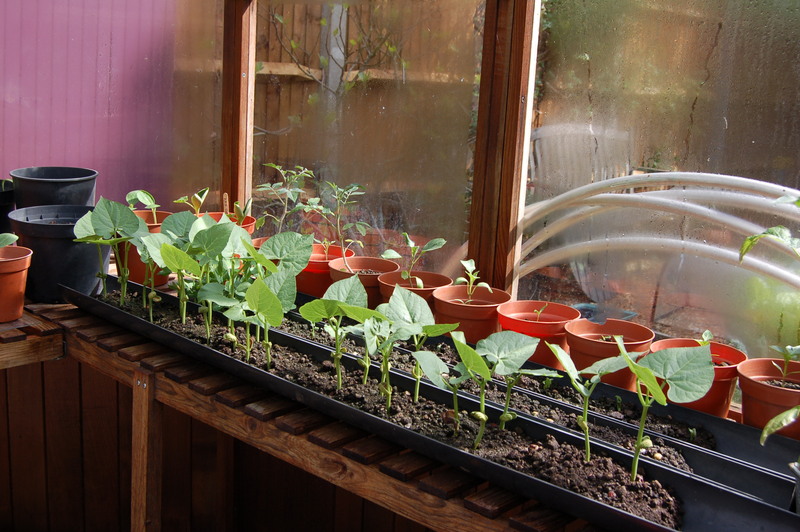 There are glaring omissions, such as french beans etc but my aim for this year is to use up existing seeds. I’ve also decided to change some of my planting methods, I’m going to go back to having tomatoes, cucumber, chillies, aubergines and melons in the greenhouse. I’ve also ordered a big trough, so I can plant the potatoes (and later salad leaves) away from the vegetable patch in an attempt to avoid early killing from blight. It’ll probably go on the drive, where we get tons of sun and also where the outside taps are so I can lessen my dragging water around should we get another hose pipe ban. I’ll add a second trough if it works and looks nice. On a slightly separate note, I bought this organic vegetable box with my Ocado order last week. 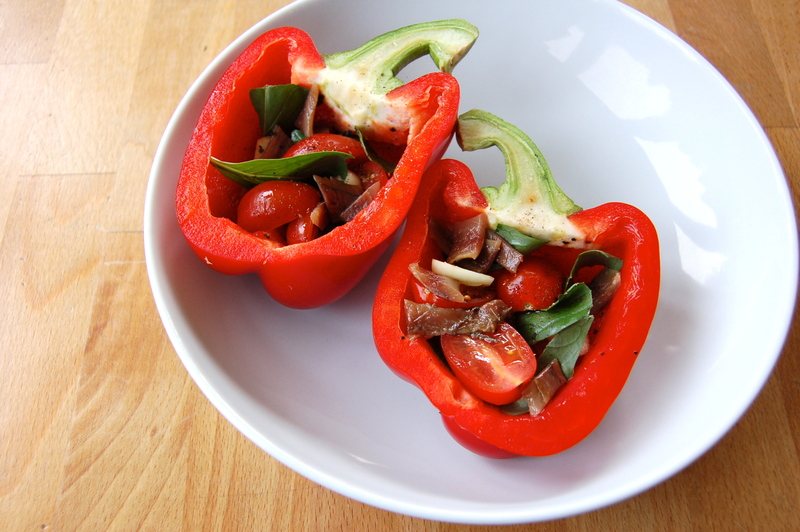 I liked it, we were forced to eat things we wouldn’t normally, for instance cabbage. It’s not that I don’t like cabbage but I’d just normally opt for kale, ideally from the garden. I can imagine the summer boxes are a little more exciting. 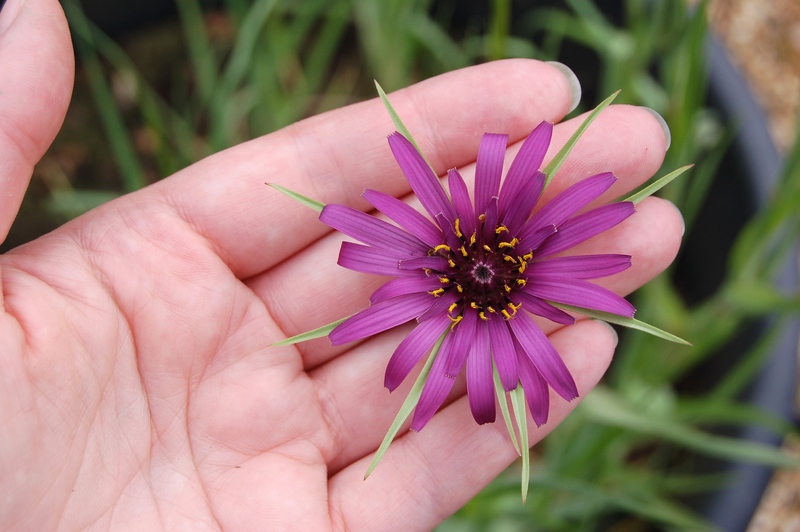 Best get out there, it’s frosty but the sky is looking promising for a bright, sunny day and one of my first jobs is to tackle the greenhouse…..oh dear!